Knockboxes are an essential item for every espresso machine set-up. We currently have the Cafe Knockbox, Home Knockbox, Drop Knockbox, Small Tubbi and Large Tubbi for sale. The designs that we have now are just fantastic; highly functional and very attractive. For 'how to use a knockbox' instruction, please click here. ​We have a new knockbox – we call it the “Home Knockbox”. The size is approximately the same as the small Tubbi. As much as we love the Tubbi design, there are just far too many copies in the market and we felt it was time to refresh the product. The knock bar is 1 solid one piece design, much more substantial than before and without plugs that come out. The design has been registered! The home knockbox may be small but it can comfortably hold 10 double pucks of coffee before it needs emptying. To empty just lift the rubber bar out and discard the coffee as you wish. A silicon ring on the bottom prevents it moving about the place and also helps to reduce the noise. To wash we recommend you just give it a rinse in mild detergent. The plastic tub is dishwasher safe but we are not sure you need to go that far as a mild rinse works every time. ​Material: ABS plastic, silicone, rubber and stainless steel. Packaging : 1 complete home knockbox per box. 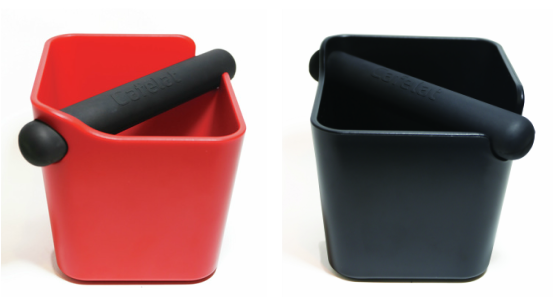 The new Large Tubbi knockbox replaces the previous Cafelat Knockbox and features the same shape as the much-loved original Tubbi Knockbox. The larger size is a scaled up version of the small Tubbi so don't worry the lovely proportions are still there. The size is almost the same as the old large knockbox and holds around 30 double pucks. This is the knockbox to have if you think the Tubbi is a bit too small and it comes in 5 great colours. Packaging : 1 Complete large tubbi per box. 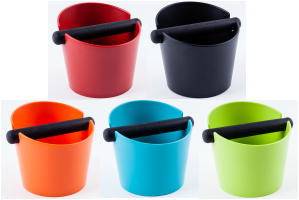 The Small Tubbi is the perfect accessory for home baristas to help you dispose of your espresso pucks. It has been over a year in development and gone through many prototypes but finally we got there in the end with a brilliant, yet very simple design. All it is, is a plastic tub and a bar! No nuts or bolts or anything. The small tubbi may be small but it can comfortably hold 10 double pucks of coffee before it needs emptying. To empty just lift the rubber bar out and discard the coffee as you wish. A silicon ring on the bottom prevents it moving about the place and also helps to reduce the noise. This is much larger size for the serious home barista or the coffeeshop. The main body is stainless steel with a brushed finish, the bar has a solid stainless steel inner core with a very durable TPR overmould and all other parts are silicone rubber. Inside is a beautiful satin bead blasted finish. Suitable for using in coffee shop or for commercial business. Requires 16cm diameter cutout in counter. 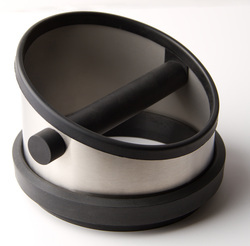 Material: Stainless Steel tub, rubber bar with a solid steel bar and rubber parts.